While a gold or silver chain can be lovely on its own, beautiful pendants can add a special something to the look. Not only can they spice up a gold chain, but they can create a focal point for an outfit. They are very versatile and can be used with different types of necklaces to achieve different looks. For example, a person might choose to wear one with a gold chain on one day and a leather cord the next. She can vary the length and the size of her necklaces to compliment different outfits. With so many styles to choose from, one can select pendants to express individuality or simply tie an outfit together. A pendant is a piece of jewelery that hangs from something else, usually a necklace but sometimes a bracelet or even earrings. They have been around for thousands of years and ancient artwork shows early Egyptians, Greeks and Romans all proudly sporting necklaces with dramatic pendants. Even the cavemen used a form of pendant when they tied pretty shells or stones on cords and fastened them around their necks. In the Middle Ages, people often wore reliquaries, which were designed to hold sacred relics, on cords around their necks or other types of devotional jewelry. They lost popularity around the 17th century and weren't frequently worn again until the 19th century, when they came back in style. Pendants make wonderful gifts for birthdays, holidays, and special events like graduations, confirmations and bat mitzvahs. They are available for all budgets and tastes, from small, simple, inexpensive gold initials to costly diamond and gemstone encrusted pieces. When presented as a gift, they are often given together with a gold or silver chain. There are a wide variety of religious pendants that can be used to honor and acknowledge a person's religion. These include crosses, the star of David, the Virgin Mary, all sorts of saints and more. These religious symbols can be simple or adorned with embellishments like golden flowers, gems, and enamel. Many jewelry stores carry religious jewelry as well as religious specialty shops. A wide variety of religious jewelry is available online. Pendants can be used to honor one's cultural heritage as well. A pretty claddagh, the traditional Irish symbol for friendship, love and loyalty, would be a wonderful gift for a person of Irish descent. Colorful enamel pieces in the shape of a country's flag, Germany or Puerto Rico, for example, are popular. Again, the internet is a great source for this type of jewelry, offering many more choices than the typical local jewelry shop. Pendants can be used to express one's interests and personality. An artist might appreciate a splashy geometric one, while a pianist might choose to sport one shaped like a musical half-note. A mother might wear a charm in the shape of a child, and a doting Black Lab owner could proudly display a dog at the end of her chain. There are volleyballs, horses, scissors and thread, books, birds, cats - something for everyone. 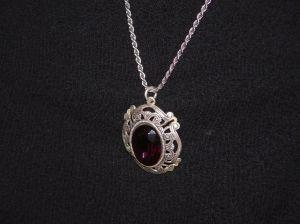 Lockets are some of the most popular examples of this type of jewelry. Heart-shaped lockets are particularly common, but lockets come in all sorts of shapes, including ovals and circles. People like to put a picture of a loved one in the locket, or sometimes a picture of themselves as children. Some put a lock of hair from a loved one in the locket. They have long been considered romantic gifts and are often given for Valentine's Day, birthdays or for anniversaries.